This entire thing was creating by a group of parent volunteers and few years ago when her son was in 2nd grade. These awesome parents put 6 stations together that the kiddos rotated through for 2 hours. Luckily for us, we continue to get parent volunteers each year to keep this event happening. Even if you cannot do all of these activities you can always pick and choose what will work best for your classroom. This craft was so much fun for the kiddos. As you can see in the picture above, your creation starts as a caterpillar and then can change into a butterfly. I found the original instructions here. Check it out for a detailed set of instructions. 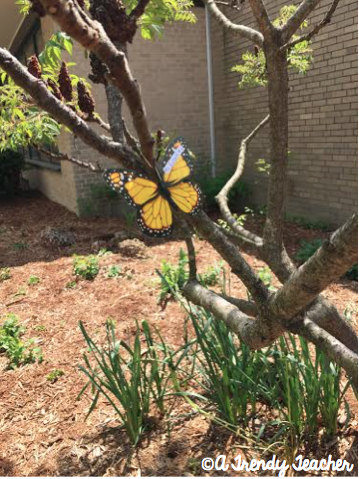 At this station students were "hunting" for butterflies that were hidden all over the front of our school. Students had a recording sheet where they could record their findings. 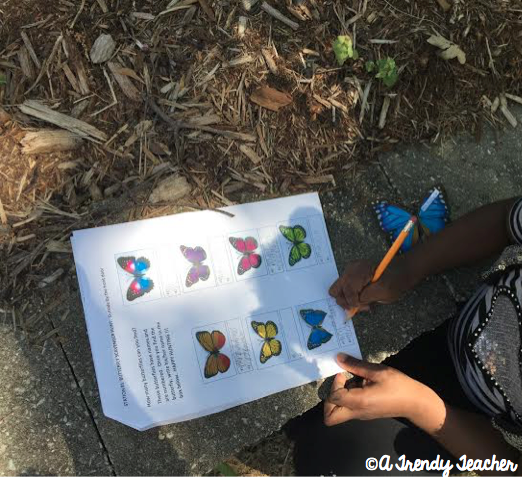 It was especially fun because each butterfly was labeled with a teacher's name, so on the recording sheet the students would write the teacher's name next to the butterfly pattern they found. At this station students practiced map skills. 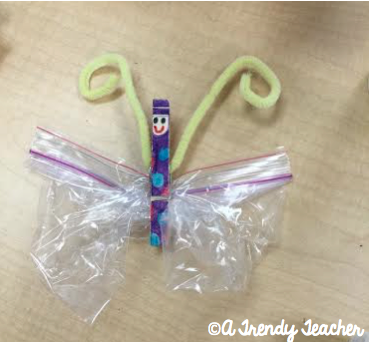 Included in our Butterfly Day packet was a map of the area where the caterpillars were hidden. When students located caterpillars, they were to mark their map with an X. The goal was to find all of the caterpillars -the kids didn't know ahead of time, but there were 60 little creepy crawlers hidden in the landscaping! This station was probably the favorite because there was a snack involved! 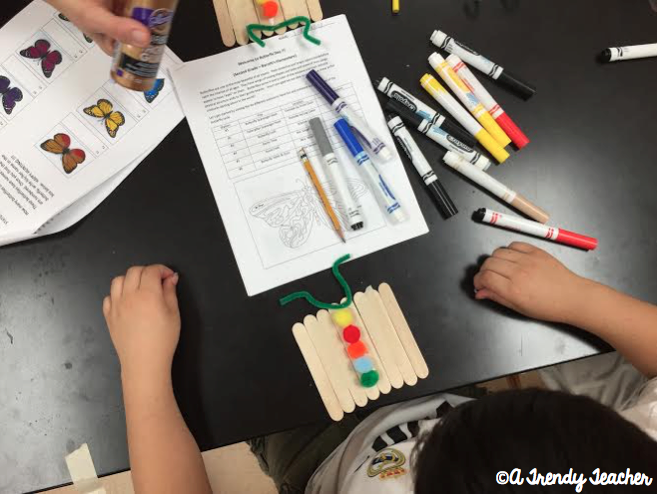 Students started by decorating their clothespin. Once that was done they clipped their snack bag in half. 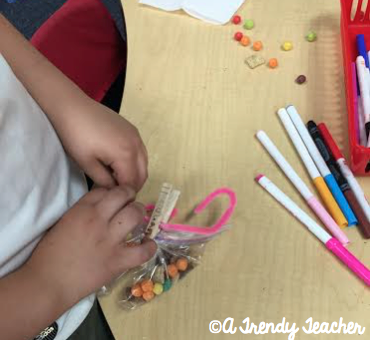 Then parents allowed students to choose which snacks they wanted to use to fill their bags. Do your students like Minute to Win-It games? Then they're going to love this stations. 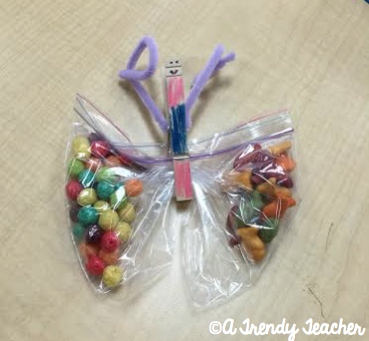 Students pretended they were butterflies using their proboscis to "eat" fruit. Students used drinking straws to move fruit from the table to the plate by sucking the fruit with the straw. At this station students watched a short butterfly video and completed a quiz. This project takes a bit more time and preparation. In the fall we began our project with Journey North called Symbolic Monarch Butterfly Migration. 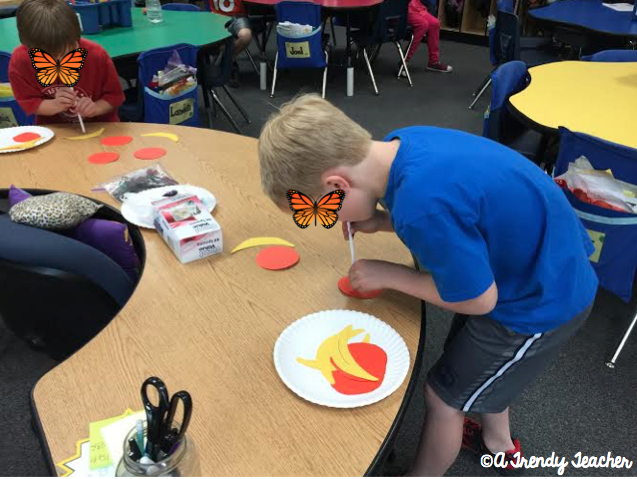 Students decorated small butterflies that we then mailed to Mexico to symbolize the Monarch Butterfly's journey south. We have just received our butterfly package back from Mexico as it symbolizes the Monarch's journey back north. 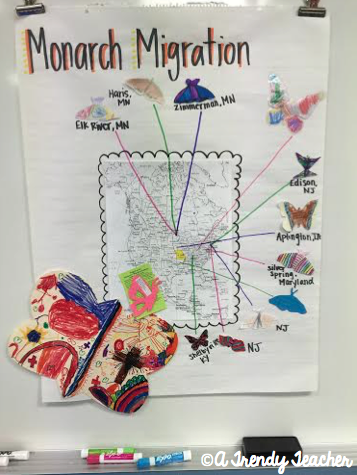 The students were excited to see that we received butterflies from all over North America. This was a bit confusing at first, but once we discussed the distance that these butterflies travel they were able to understand why they might not make it back to their exact home. 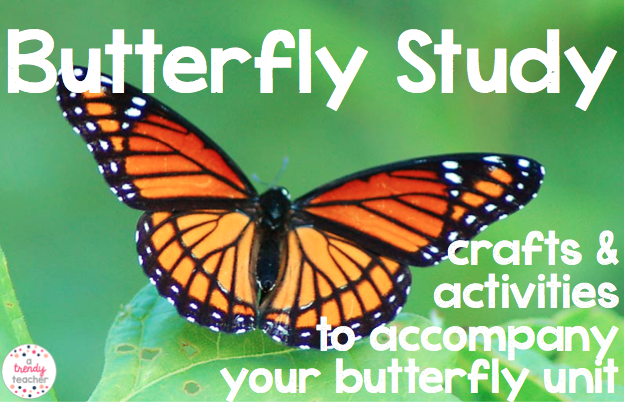 Be sure to check out the Monarch Butterfly Journey North website for tons of resources you can use in the classroom during your butterfly study! We are excited to be raising 20 butterflies in our 2nd grade classroom. All materials needed for this project were ordered through Carolina Biological Supply Company. 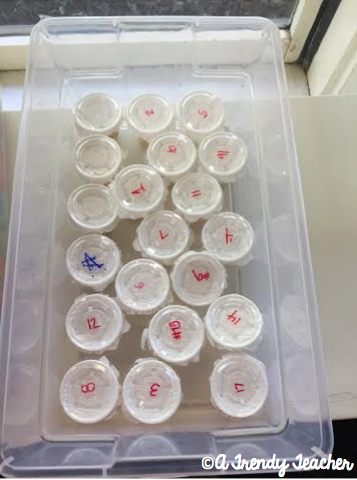 When the caterpillars arrived we (the teachers) organized them in their new habitats. Each student received their very own caterpillar. 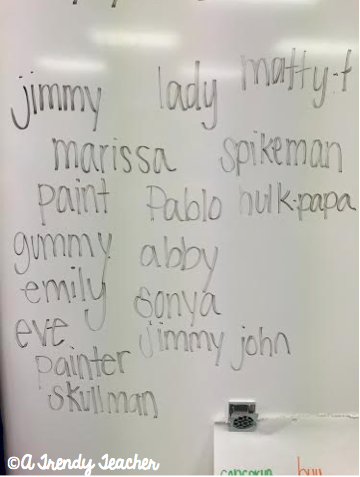 We spent time making observations and naming our critters. Make sure you follow my Butterfly Study Pinterest board so you can keep up with all things butterflies. 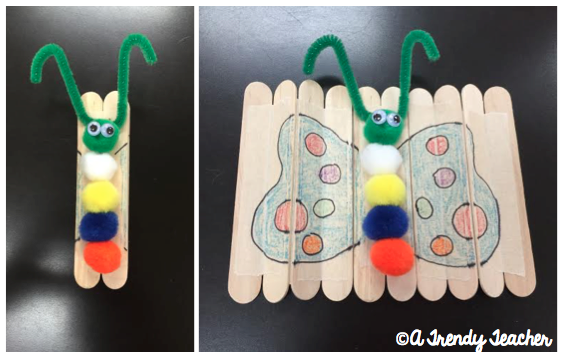 Follow Melanie's board Butterfly Study on Pinterest.